Internally TIG and Externally MIG welded for absolute Quality. Specific Design for the Estate / Wagon Model. 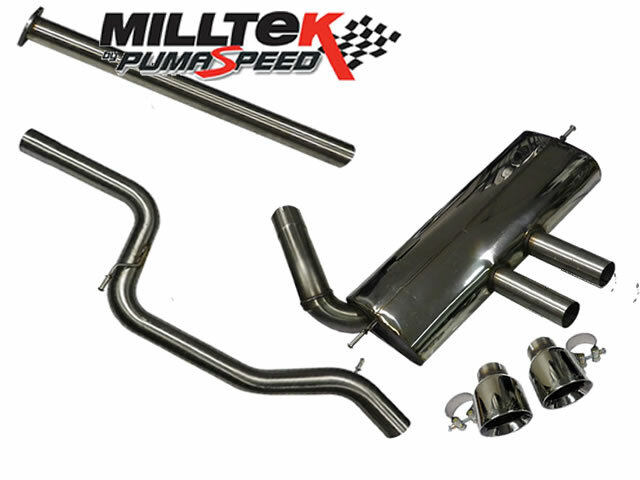 The precision designers at Milltek Sport and the inspiration behind some of the fastest Fords in Europe, Pumaspeed, bring you the sheer artwork of the Hand crafted Motor Sport Exhaust System. With the choice of tail pipes this new system will be the one to beat on Quality, Tone and sheer Desirability. There are 3 choices for exhaust tips ..
All noise levels have been tested and found the just right sweet spot that will deliver the roar on command but remain subtle enough at autobahn speed cruising. The Pumaspeed Workshop team are ready to fit the Milltek Sport Focus ST 250 Cat Back Exhaust Hatch (Non Resonated) Louder in our Head Office located here. Therefore making parts and labour a total cost £764.50 (inc. VAT). Pumaspeed have a specialist distribution team that can dispatch the Milltek Sport Focus ST 250 Cat Back Exhaust Hatch (Non Resonated) Louder to any destination worldwide.